Is varnish needed for waterslide decals? Subject: Is varnish needed for waterslide decals? I know that microset and microsol are used when applying waterslide decals but should I apply a glossy varnish before and after the transfer? I don’t use varnish with sol/set. Haven’t noticed any silvering, and nothing rubbed off yet on the ones I used it with. YMMV. When the experts recommend something, it’s normally for a good reason. Unless they are all in the pockets of Big Varnish. Yes, it's recommended, for damn good reasons, too. Eventually, all the standard modelmaker's techniques filter down to gaming. Pigments and weathering powders? They were a thing 30 years ago for nmodelmakers. Vanish before AND after. Gloss before, gloss after. All that microsol/set do is soften/reharden the decal film, allowing for better shaping of it over non-flat surfaces. It's still a very thin membrane that scratches off easier than paint on an unprimed model. The varnishing also prevents silvering (which is air trapped under it from a matte surface). Old enough to know better, young enough to not give a ****. ... and yet, with strange aeons, even death may die. Subject: Re:Is varnish needed for waterslide decals? Does the varnish affect how the part of the model looks? Does it make it look different from the rest of the miniature? It will, but you're going to hit the whole model with a varnish layer (usually matte) once you're done painting to unify the shinyness levels anyway. Once you put that matte layer on everything the formerly glossy areas where you put the decals will be indistinguishable from the rest of the model. Yes, it's recommended, for damn good reasons, too. It's only "recommended" because it's scale modeling dogma. It's been repeated so much by so many people that it's now just assumed to be the gospel truth. Applying a varnish, gloss or otherwise, before adding decals doesn't make a difference. Decals are essential thin layers of lacquer paint printed onto a transparent film. Once properly applied to a surface, they're surprising resilient, especially thicker ones like GW's. Can they be damaged after they've dried? Sure, I do it on purpose sometimes, but I have to try pretty hard and use a scalpel blade to do it and I have to be careful not to damage the underlying paint. A fully dried decal that's been properly applied isn't going to scratch off really any easier than the paint under it. No it doesn't. Proper application with setting solutions prevents silvering, but even then it can only go so far. Some decals, especially really thick ones just don't want to bed down, just don't want to cooperate with decal softening and setting solutions (in fact, extra crappy decals will only react to lacquer thinner, but they're pretty rare nowadays). Also as side note, what a lot of people call "silvering" isn't actually silvering, it's the difference in finish that the decal film has compared to the painted surface. That all being said, I usually apply my decals over a semi-gloss or matte finish, depending on what kind of finish I want my first round of weathering to be on (if I'm starting with enamel washes it's usually semi-gloss, if I'm starting with oils it's matte). Also, don’t take any of this to mean that you shouldn’t use a varnish prior to applying decals; if that’s what you want to do, it isn’t going affect anything other than making your project take longer to finish. It’s just an unnecessary step. "When the Internet sends its people, they're not sending their best. They're not sending you. They're not sending you. They're sending posters that have lots of problems, and they're bringing those problems with us. They're bringing strawmen. They're bringing spam. They're trolls. And some, I assume, are good people." I've never seen it done the way I do it, so I'm not sure whether this is the common practice, but I apply my decals onto wet varnish, then go over with matte varnish once it dries. This helps blend in the silvering at the edges of the decal without the use of microsol/set. I always gloss before decalling. The primary reason is pretty simple - a decal will only conform so far (even softened). A rough surface (such as that presented by a very matt surface) will trap air underneath the decal. This causes silvering - the area of the decal appearing whitish / foggy (not just a bit shiny). A gloss high-flow medium will seal that (most glosses are actually fairly high flow as this helps with self-levelling). In terms of eventual finish - unless you're sploshing varnishes on super thick, you shouldn't have a problem. If you're going to do a lot of layers, then airbrushing (you don't need an expensive setup for this sort of work) is the way for a nice, thin, even coat. Typically a decalled model will have 3-5 varnish coats for me, I've had some with more, but those were much more complex (salt chipping / camo / decalling etc). So, I disagree with Scooty about the necessity of it. I've found that as 'best practice' the time involved in not fething it up beats the time involved in fixing it when it does - and that from a professional standpoint where time is money. I've tried with and without varnishing, and using varnish always works and looks better. It's an extra step, but if you're using transfers, you're already going above and beyond most of the painted models I see, so why not at least make it look great? As an added plus, I've found that the varnish, micro set/sol, then varnish again method is actually less frustrating for me. Even on very tight curves, I can get the transfers to perfectly conform to the contour after a few passes with the micro sol. This is without having to cut them. And I never get air bubbles. It's one of those work slower to work faster type of things. If you don't believe folks that advise varnishing, just do two marine shoulder pads with the different methods and compare. If you find that you don't benefit from varnishing first, then by all means don't! If a surface is rough enough to prevent a decal from bedding down with setting solutions, a thin layer of gloss won't fix that; you'll just have a glossy rough surface. A smooth coat of paint over a smooth coat of primer over a smooth piece of plastic is going to handle decals just fine as evidenced by the numerous models I have personally, including ones paint with Tamiya paint, which is far more matte than any paint made by GW, Vallejo, or any other wargaming-focused paint manufacturer. Stubborn decals exist and sometimes something stronger than MicroSol is needed to get them to cooperate and whether or not there's gloss under them isn't going to matter. The one simple answer as to why gloss is unnecessary, just look at aircraft panel lines and tanks with zimmerit texture on them. Especially with the zimmerit, it's far rougher than a couple of smooth airbrush-applied layers of paint on a flat surface, yet it's entirely possible to get a decal to settle down on it just fine without gloss. It's dogmatic to say that gloss is necessary to apply decals, plain and simple. I use a thin layer of gloss varnish before and after the decal. If that makes that area more shiny than desired, hit it with semi-gloss or satin varnish at the end. Hrm, it's really hard to see anything in that video as he constantly shakes things under the camera. Honestly, I don't think he really proves that using gloss pre-decal is worse than none at all. In fact, if I had the sound turned off and didn't read the description of the video, I'd think he was proving that gloss varnish first provides nicer results! He even said he gloss coated the decals after and wet sanded them to blend them in! I think all that video really shows is just how terrible the decals he was using were. Saying that a glossy rough surface is the same as a matte rough surface is simply untrue. GIven the same surface prep and equally skilled application, a gloss finish will always be smoother than a matte application. That's just the physics of the way the surfaces are made to be glossy or matte. Matte surfaces are matte BECAUSE they're rougher. The light scatters. It's one of those things where some people will be happy with the results they get vs effort put in, while others won't. If you're happy with the way your decals look and the way they slide on after comparing with and without gloss varnish first, then stick with that. In fact, with the recent decals GW have been providing, I had some good luck using just micro-sol and micro-set on bare paint myself, because I was out of gloss varnish at the time. But, there was one decal on that model that I was definitely not happy with and it had to be re-done as it had just the faintest bit of odd sheen or silvering (I can't remember--it was like a year ago, but I do remember going straight out and buying more varnish because of it). If you're airbrushing your paints, then you probably won't notice as much difference, eiither, because your surface will be much smoother to begin with than if you had brushed on your paints. I think the TRUE magic is with the Micro-Sol in how it softens the decals. Even before applying my post-decal varnish, if I use multiple passes of Micro-Sol, the edges of the decal start to soften and blend into the surrounding panel. You really don't HAVE to do it this way. You don't HAVE to do anything you don't want to do. You definitely don't NEED to. Heck, I'm not even saying that you SHOULD, but in my direct comparisons, I've found this way works consistently best for me. If that's more steps than you want to take, then don't! 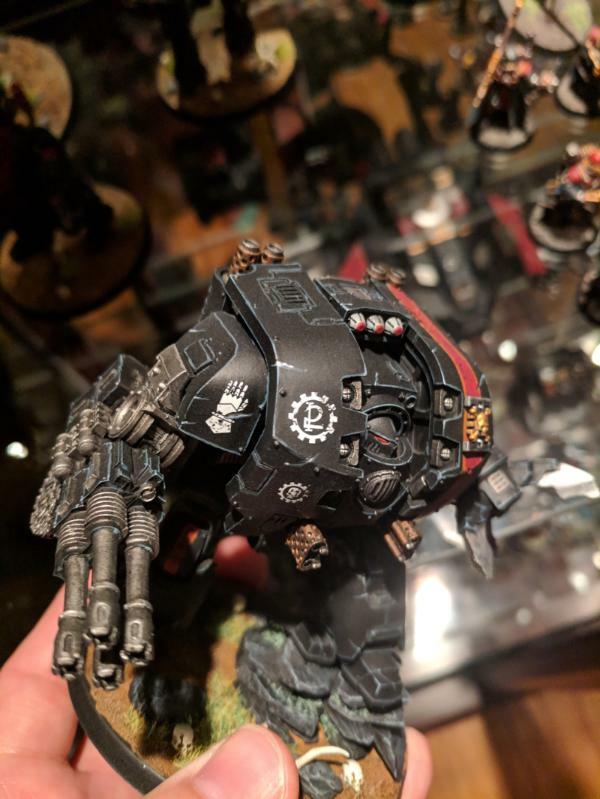 As you can see I did what others would say is a shortcut or cartoony finish by painting in pure black and edge highlighting, as opposed to a very dark grey with shading and highlighting. I didn't want to take the extra steps, and I'm happy with the way it looks (it matches the rest of my DW). Ugh I'm sorry but that video just annoyed me! He damn near built a straw man purely out of matte varnish and extremely lumpy basecoats!